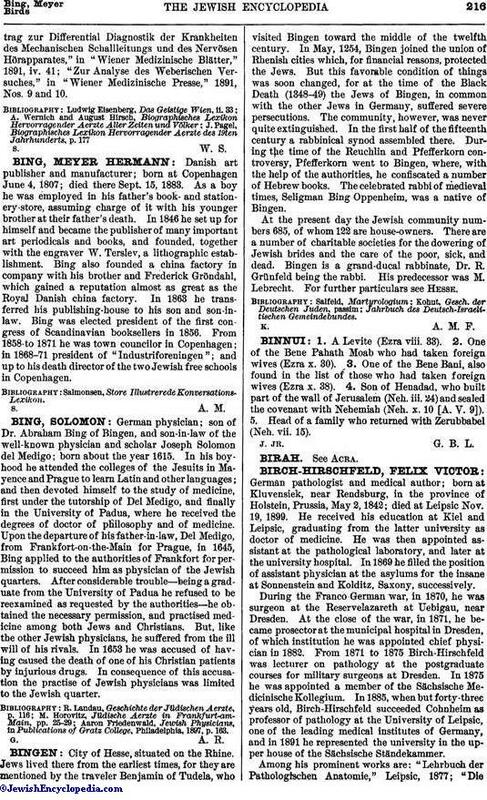 German physician; son of Dr. Abraham Bing of Bingen, and son-in-law of the well-known physician and scholar Joseph Solomon del Medigo; born about the year 1615. In his boyhood he attended the colleges of the Jesuits in Mayence and Prague to learn Latin and other languages; and then devoted himself to the study of medicine, first under the tutorship of Del Medigo, and finally in the University of Padua, where he received the degrees of doctor of philosophy and of medicine. Upon the departure of his father-in-law, Del Medigo, from Frankfort-on-the-Main for Prague, in 1645, Bing applied to the authorities of Frankfort for permission to succeed him as physician of the Jewish quarters. After considerable trouble—being a graduate from the University of Padua he refused to be reexamined as requested by the authorities—he obtained the necessary permission, and practised medicine among both Jews and Christians. But, like the other Jewish physicians, he suffered from the ill will of his rivals. In 1653 he was accused of having caused the death of one of his Christian patients by injurious drugs. In consequence of this accusation the practise of Jewish physicians was limited to the Jewish quarter. Aaron Friedenwald, Jewish Physicians, in Publications of Gratz College, Philadelphia, 1897, p. 163.